Water scarcity, seasonal and mid-season droughts, and poor soil fertility are among the most important constraints to crop productivity in southern Malawi. Increased agricultural productivity will require increased efficiency with which both water and nutrient resources are utilized. Currently, fertilizer management recommendation in smallholder irrigation systems are not defined, while farmers base irrigation schedules on arbitrary observation of crop performance and soil moisture, leading to poor productivity of scarce nutrient and water resources. IPNI is collaborating with the International Atomic Energy Agency in a project to develop best management practices for water and nutrient management in the production of maize in southern Malawi using both conventional and isotopic techniques. Factorial experiments consisting of three irrigation treatments (50%; 100% and 150% ETc) and three nitrogen (N) fertilizer treatments (0, 50 and 150 kg N/ha) were carried out for 2 years. A control treatment with no irrigation and fertilizer was also included. All treatments consisted of three randomized replicates. 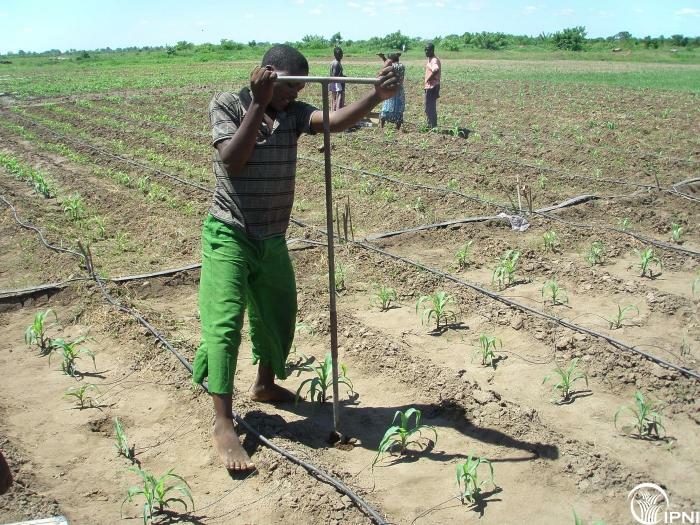 Irrigation was scheduled using drip irrigation based on soil moisture determined using the CPN 503DR neutron probe at 20 cm intervals to 150 cm depth. Crop growth monitored through canopy cover was carried out at weekly intervals. Irrigation and rainwater samples were collected at each event, and soil samples to 20 cm depth were also collected three times over the season for δ18O analysis. The Dynamax sapflow gauges which use the heat balance method was used to estimate water transpired by the crops. A simple isotope mass balance model will be used to determine the fractions of water lost through soil evaporation and leaf-transpiration. Inputs to the model are: precipitation amount, δ18O of precipitation, irrigation, depth weighted volumetric soil-water content at initial and final times, and initial and final amount. 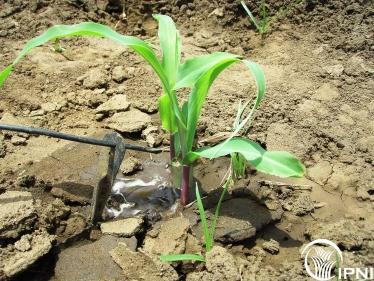 Water and nutrient are critical in enhancing crop yield and water use efficiencies in smallholder farming system in Malawi. Preliminary project results have shown that significant yield improvement can be achieved by supplemental irrigation and the application of N fertilizer. The proportion of soil water losses through evaporation and transpiration was carried out using both sap flow and the δ18O composition mass balance approaches. Transpiration accounts for some 40% of total water loss in the first 50-70 days after planting in the 100%ETc treatments and was estimated to be 20-25% in the first 50 days of the season indicating majority of the water lost was through soil evaporation.